This Audi A1 has got plenty of pulling power for a 999cc engine. For a brand known for performance cars to offer a model with a 1.0-litre, three cylinder petrol engine might seem like a strange move. 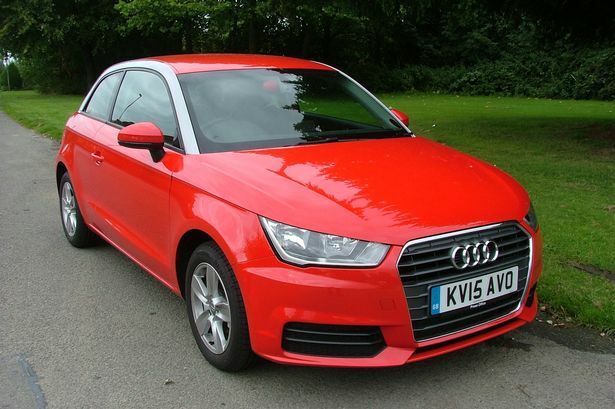 But the Audi A1 1.0 TFSI is a car which punches above its weight. The new addition to the A1 line-up develops 95bhp and will accelerate to 62 miles per hour in a very respectable 10.9 seconds. It feels like a car with a sprightly 1.4-litre powerplant beneath the bonnet rather than one with just 999cc . In fact it’s so good that on my first drive in the car I was convinced the wrong vehicle had been delivered – one with a larger engine. Despite four people being on board it pulled heartily, accelerated with gusto and was decidedly quiet. Under normal driving conditions you are not aware that the engine is one cylinder short of the norm. Only when you accelerate hard can you hear the distinctive three cylinder burble. average more than 67 miles per gallon and has such low emissions you don’t pay any road tax. And while the A1 is the smallest model Audi produces it still has the same quality feel to it that its more expensive siblings are known for. The latest generation has undergone a few changes too, with a new flatter and wider single frame grille, new bumpers, new standard alloy wheel designs and a choice of new colours. The steering has also been upgraded with the fitting of a new electromechanical system to give the driver optimal assistance in all driving situations, becoming firmer as the vehicle’s speed increases. The suspension on the 1.0-litre is geared more towards comfort than sport but despite that it offers a ride firm enough to give sporting handling when pushed hard – true to Audi’s heritage. The five-speed manual gearbox is slick in operation but you have to work it to get the best out of the car. On-board features include alloy wheels, remote central locking, air conditioning, electric front windows and mirrors and a six-speaker single CD audio system with auxiliary iPod connection linked to a discreet 6.5-inch retractable display which sits on top of the dashboard. But in addition there are plenty of options to allow you to personalise the car. My test car came with two-tone red and silver paintwork while the black interior was brightened up with the addition of red highlights on features like the air vents, door handles, gearshift surrounds and interior mirror – a £500 optional extra. Other additions included leather seats, a multifunction steering wheel and heated front seats, pushing the price up to just over £18,000. And if you are so minded you can push it even higher. Given the size of the car the interior space is generous. Boot space, however, is not great when it comes to handling larger items, although there is always the option to lower the rear seat backs. Overall, however, the new 1.0-litre A1 is an impressive package which defeats any preconceived ideas you might have about small cars with small engines. In fact this car is a bit of a revelation, and well worth a close look at. Mechanical: 999cc, 95bhp, 3 cyl petrol engine driving front wheels via 5spd manual gearbox.